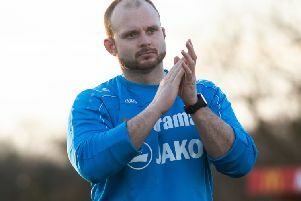 Dean Brennan is busy planning for next season at Hemel Town – and has dismissed rumours linking him with the vacant Chelmsford City manager’s seat. Reports suggested Brennan is among three names the fellow National League South club were considering alongside caretaker boss Kevin Maher and Bishop’s Stortford manager Rod Stringer. But the Hemel boss said on Monday: “It’s flattering being linked with it but it’s speculation, nothing more than that. “It’s flattering because it shows people recognise the good job we’ve done here but that’s all it is. You always get speculation around these things. As far as I’m concerned I’ve got a year left on my contract here. Indeed preparation for the next campaign, the Tudors’ third at this level, is already well advanced. Last season the side, who fell just short of the play-offs, was plagued by injuries and Brennan said this was something they had taken on board when looking at recruiting this season: “We are going for a slightly different age group of players, maybe a little younger than we did last year. “The injuries we had caused turmoil, we used way too many players, so we’ve done a little more research. He said the club had compiled a long list of players they were looking at for the 2016/17 campaign and he believes the squad will start to take shape in the next couple of weeks. He said: “We always set ourselves targets and the last couple of years we haven’t achieved them. Pre-season training will begin on June 25.